The arrangements for the renewal of the International Group General Excess of Loss (GXL) reinsurance contract and the Hydra reinsurance programmes for 2018/19 have now been finalized. Notwithstanding the uncertainty in the insurance and reinsurance markets following the 2017 windstorm, earthquake and wildfire events, the Group, with the support of its programme leader and panel of reinsurers, has once again been able to advance the traditional renewal timetable by approximately one month with the objective of assisting both shipowners and clubs in their negotiations for the 2018/19 P&I renewals. The loss experience of the reinsurance programme on the 2012/13 to 2017/18 (year to date) policy years remains acceptable to reinsurers, notwithstanding some claims development over the year. This factor, combined with continuing surplus market capacity, the continuing positive financial development of the Group captive, Hydra and the effective use of multi-year private placements has enabled the Group to achieve satisfactory reinsurance renewal terms which will result in a further year of reinsurance rate reductions across all vessel categories. The individual club retention, which was increased with effect from 20 February 2016 to US $10 million, remains unchanged for the 2018/19 policy year. The attachment point on the Group GXL reinsurance programme, will remain at US $100 million for the 2018/19 policy year. Following a detailed review of the current pool structure during 2017, a number of recommendations for changes to the pool structure were made by the Pool Review working group, aimed at simplifying and improving the efficiency of the pooling arrangements. These changes were reviewed and approved by the Reinsurance subcommittee. At present, the lower pool layer attaches from US $10 million to US $45 million, and the upper pool layer attaches from US $45 million to US $80 million. With effect from 20 February 2018, the lower pool layer ceiling/upper pool attachment point will be lifted from US $45 million to US $50 million and the layer from US $80 million to the GXL attachment (US $100 million) will be absorbed into the pool and merged with the upper pool layer which will attach from US $50 million to US $100 million with an individual club retention of 7.5% across the layer. A diagram showing the revised pool layer structure for 2018/19 is included below. Currently, the layer from US $80 million to US $100 million is reinsured 100% by Hydra. 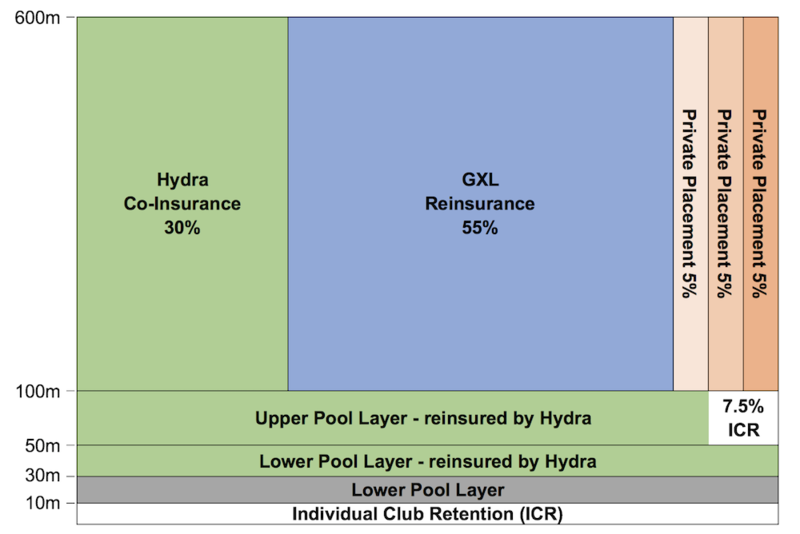 From 20 February 2018, following the changes to the pool structure outlined above, the Hydra reinsurance within this layer will be reduced to 92.5%, with the remaining 7.5% retained within the individual club retention. layer. Hydra also currently reinsures 30% of the first layer of the GXL (US $100 million to US $600 million) which will remain unchanged for 2018/19. The three multi-year private placements covering the first and second layers of the Group GXL placement (US $1 billion excess of US $100 million) will remain in place for the 2018/19 policy year. The market reinsurance cover (US $190 million excess of US $10 million) which was put in place with effect from 18 January 2017 as part of the solution developed by the Group clubs to meet shipowners’ certification requirements under the financial security provisions of the Maritime Labour Convention, will be renewed for a further 12 months from 20 February 2018 with an increased limit of US $200 million at a competitive cost which will be included within the overall reinsurance cost. The diagram below illustrates the revised participation structure of the first layer of the Group GXL programme for 2018/19. In accordance with the Group’s general reinsurance cost allocation objectives, principally that of moving towards a “claims versus premium” balance for each vessel type over the medium to longer term, the Group’s Reinsurance Strategy Working Group and Reinsurance Subcommittee have again reviewed the updated historical loss versus premium records of the current four vessel-type categories. This detailed review included a focus on claims by vessel type, and consideration of whether the available claims data merited extending the current vessel-type categories for the purposes of the reinsurance cost allocation exercise. In the clean tanker category, there has been some further development during 2017 which continues to impact the clean tanker record, whilst the dirty tanker record continues to show improvement. In the dry cargo category, during 2017/18 the claims and premium record has continued to develop favourably. The subcommittee once again reviewed the desirability of, or necessity for, separating container vessels from dry cargo vessels for reinsurance cost rating purposes, and concluded that there still remains insufficient historical claims data to support separate treatment for the 2018/19 policy year. In the passenger category, the claims and premium record has continued to develop favourably. Based on its review of comparative performance by vessel type category, the Reinsurance subcommittee did not consider that there is any compelling case to prefer one sector/s over others, and felt that the appropriate approach for 2018/19 is an even spread across all categories. This is another positive reinsurance renewal for the International Group and its Members, particularly when viewed against the challenging background of the significant impact on the global insurance and reinsurance markets of the 2017 natural catastrophe events, and it represents a fourth consecutive year of renewal premium reductions on the Group programme.